Pop Up Ave, State College's urban-style pop up flea market, is returning for another round Saturday. With about 50 vendors of vintage and hand-crafted wares, along with local food purveyors, live music and beer, Pop Up Ave is set for 11 a.m. to 7 p.m. on Saturday on the 100 block of South Fraser Street. Saturday's event will mark the third time for Pop Up Ave to be held on Fraser Street. Created in 2016, the first Pop Up Ave fleas were held in the former Garner Street lot, which is now being developed for a mixed-use high rise. A winter market was held on Fraser Street in December 2017, and the full Pop Up Ave took place there in April. 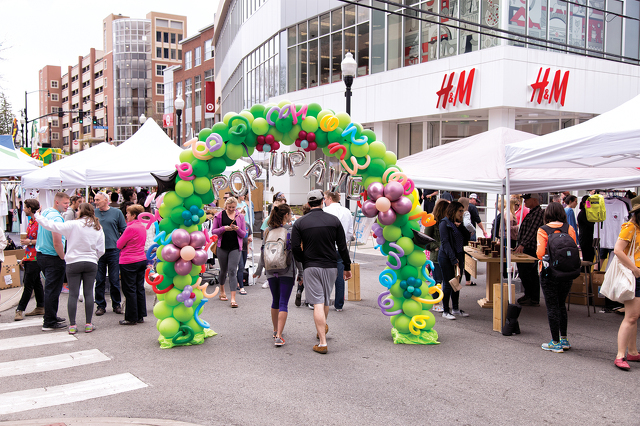 Pop Up Ave has grown in popularity since its inception, becoming a new State College tradition that draws more than 3,000 people. Brad and Andrea Groznik, Penn State graduates who returned to State College after living in New York, co-founded Pop Up Ave when they realized the urban flea market concept would translate well to the Centre Region. Popularized in major cities, urban flea-markets give visitors a chance to check out unique and trendsetting items from a wide range of vendors. Elk Creek Cafe & Aleworks will provide a beer garden, which will be fenced off and require identification. Other food and drink will be offered by Brazilian Munchies, Husky Bros Popcorn Co., Moody Culture Kombucha and Koo-Weh Nana Baklava. For more information visit www.popupave.com.